The final part of my fish and chips meal was the chips. Given the number of restaurants that don’t seem to be able to get french fries right, I was expecting them to be rather difficult to make. I like my fries nice and golden brown and slightly crispy on the outside and soft, warm and creamy on the inside. I had heard that a good way to get nice and crispy fries was to fry them twice. The idea is that you fry the hard raw potato slices until they are soft and floppy and remove them from the oil. The temperature of the oil is then increased and the fries are fried a second time. Since I don’t have a deep fryer I used a large sauce pan filled with oil and I estimated the temperatures. I was a little bit surprised that the chips came out really well; They were just how I like them. I enjoyed the chips with salt and malt vinegar and I dipped a few of them into the tartar sauce . They really made the fish and chips meal complete. In the future, when I have a craving for chips I will be able to satisfy it at home. Cut the potatoes into the desired shape. Heat the oil to 325. Add the fries and fry until pale and floppy, about 2-3 minutes, and remove. Heat the oil to 375. Add the fries and fry until golden brown, about 2-3 minutes and remove. those look seriously good and crunchy. i love a nice balance of crunchy exterior and creamy interior as well! Double frying..I am glad to see it actually works..I think I saw it on Good Eats..and thought it was an interesting concept! I would say more often than not most restaurants don’t get them right. I love a crunch to them and if I make the mistake of telling them that(if I know the restaurant makes them soggy) they just end up burning them. Yum. Those fries you have there though look like something I could eat a whole bucket worth. 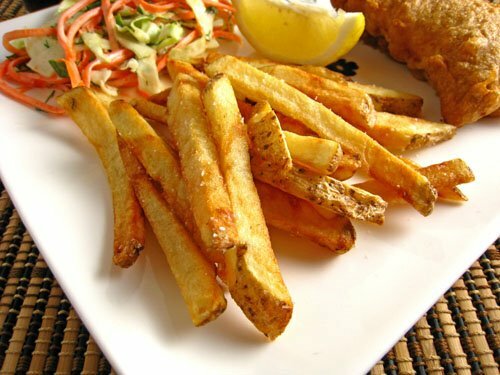 I love a good French fry… and when they’ve been hit with a dash of salt and malt vinegar, they’re even better! Love the fish and chips meal. Kudos for doing it yourself. I find that most restaurants nowadays can’t even do fries correctly. Such a shame. A real good fry is hard to find. Oh-just made some of these a couple days ago for the kids. Trouble is now they want more and more and more. They look fab. Chips look so golden and crisp just how I like them yum. Your fries look amazing! Nice and crisp! I could eat those every day – with malt vinegar, of course! I’m impressed that everything on that plate was homemade, including the fries! They look perfect. I’ve read about this method of frying fries. But I got a little lazy along the way. But since you say it works out good, I’m gonna do it this way too! I like how you broke it (the fish n’chips menu)down for us. Your fries look perfect. I microwaved the potato slices before frying them twice and they turned out great! I have heard the same thing, glad you tried it. I am making Tempura tonight so I will keep my deep fryer out and try chips later this week. I am also a fry snob! I love chips done the way you do too! they look great! Judging by the picture I would say these turned out extremely well. Yeah, that’s how the English recommend cooking chips 🙂 They look perfect, nice job Kevin! A golden crunchy chip. Sometimes it’s the difference between happiness (with chip) and misery (no chip)! Yummy!! I really like to make these types of recipes in my kitchen!! Your entire fish & chips meal would be enjoyed by my family! We love homemade french fries! How true: restaurants never seem to fix fries right. These look awesome. I’ll have to try frying my fries twice next time. Found your site through Paninhappy.com and everything looks GREAT! Can’t wait to try your tarter sauce! chips! classic 🙂 looks wicked. Nice chips – You HAVE to have vinegar on chips! I’ll have to tell my hubby about the double frying since he’s been wanting to make fries at home. Yours look awesome! I’ve always wanted to try the double frying, but never have. But your fries look so perfect, I’ll definitely have to try it soon! Bravo for recreating a meal most of us have only savored outside our homes! I couldn’t resist. I snagged this, along with your previous three posts and I’m making it all tonight! mmm, chips… my favorite comfort food! And chips with tartar sauce are genius! I can’t resist this! I am glad that I don’t have any diet restriction. Just have to tell myself, I can eat everything and anything, but in moderation! Life is good! rinse them first and they wont brown as fast…but hey…these look great. i have been craving some quality fries lately! deff gonna give this a try! I’m not at all surprised they turned out well, as everything you make is seemingly perfect. They are perfect! That’s exactly how they do it in restaurants, frying them twice. Ilove how you left a bit of the skin on! And restaurants…lots of them serve horrible fries because they either did not get the temperature of the oil right, or they use frozen fries. Choose the right potato, in belgium “bintjes” are the ones used for fries. Dont use too sweet potatoes, they ll go brown, but not crunchy. Peel and cut them in fries of 1cmx1cmxlength of potato. Wash them a few times in cold water until the water stays clear. Best fries are fried in “ossenvet”, but u can use a frying oil. Fry them at 160° celsius for about 5 minutes,they should stay yellow. Fry them in not too big portions, otherwise the oil will cool down too much. Shake and let them cool down in a bowl with some kitchen paper. Fry them a second time at 180° C till gold yellow/brown and crunchy, shake them in a bowl wih kitchen paper to remove the oil. Serve with mayonaise and some salt if you want. You sure did describe the perfect fries, I’m sure they tasted awesome! The other day for the first time I tried making some chips. Erm, yours look better than mine did. Mine was also a bit pale and floppy. Oh, I don’t think the people who work for minimum wage in restaurants really care much for the chips being fried to oblivion. They’re just getting through their day and thinking about how to spend the next paycheck. Wow, those chips look great! Your entire meal was really beautifully constructed … from the fish, to the sauce, to the slaw, and the chips! I bet you really enjoyed that first bite! woah, they DO look PERFECT!! fabulous looking fries, double frying is the only way to go. Super meal! i love making my own french fries – beats the frozen ones any day! yours look great; nice and crispy! Those look good! Thanks for the great tip about frying them twice. oh, so is that then? frying twice? i never have managed to get that perfect crisp from the outside..i was told that one secret could be rinsing the peeled potatoes for literally hours before frying them… but that didnt work for me. Will have to try double frying!! fingers crossed, if it works then i’m thank you in advance!!! Chips are my first, my biggest, my gratest “coccola”-food: they are able to comfort me, always!